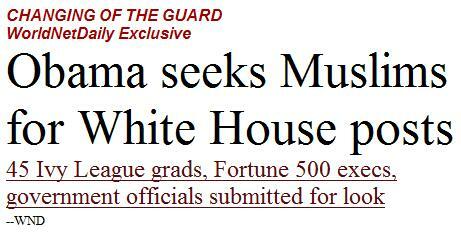 WASHINGTON – Barack Obama is conducting his own affirmative action program to get more Muslims in the White House. The move began with Rep. Keith Ellison, D-Minn, who took his oath of office with a hand on the Quran, to solicit the resume of what he considered to be the nation’s most qualified adherents of Islam. In a bid to get more Muslim Americans working in the Obama administration, a book with resumes of 45 of the nation’s most qualified — Ivy League grads, Fortune 500 executives and public servants, all carefully vetted — has been submitted to the White House. Well, so what if “Obama gets list” (and an unsolicited one at that) is not quite same thing as “Obama seeks Muslims for White House Posts”? The latter is more likely to provoke paranoia and fear about B. Hussein X (© Sadly No! ), so is obviously perfectly justifiable. But does the Congressional Muslim Staffers Association, or any of the “45 of the nation’s most qualified” Muslims have any links to the Muslim Brotherhood? Not a question likely to be asked by any of WND‘s target readers. James Yeomans began organising the event after the disruption at last week’s homecoming parade for the 2nd Battalion of The Royal Anglian Regiment, nicknamed The Poachers. An earlier report tells us that Yeomans is himself a former member of the regiment. Well we were about to take to the streets in protest for the sake of our country! Two Facebook groups are named alongside “March for England”: they are “Defence of the Realm” and the “Welsh Defence League”.